King Of Kings(IRE) has been in the news for much of this year for all the right reasons, starting off most of this year as the Leading National Sire of Two Year Olds by Stakes Earned. Surrounded by stallions whose service fees last year range from R60 000 – R150 000, King Of Kings is certainly outstanding value considering what he has achieved. His service fee last year was R20 000. 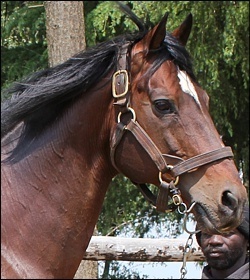 Alan and Vera Sutherland of Somerset Stud, where King Of Kings started his South African breeding career, says this of the stallion: “He is a well travelled horse that Alan had eyed for a long time. He is a Sadler’s Wells and a great horse who had a lot of speed and turn of foot – as a two year old he was incredible. “Having stood King of Kings since 2006, we have found him to be a very happy, spirited horse who knows what is going on around him. Since he arrived in October 2006, his book has been over a 100 mares every season. The King Of Kings syndicate have supported him and he will always throw you that ‘big one’. He is a very good, fertile stallion and a no-nonsense stallion. He is the kind of stallion that likes to have his mares close and he likes to be able to see them. He is a pleasure to have and has produced some fantastic stock. He upgrades mares very quickly. King Of Kings is currently lying third on the National Sires of Two Year Olds log by Stakes Earned behind the likes of Trippi and Var. The only son of the mighty Sadler’s Wells standing in KZN out of of Zummerudd by Habitat, King Of Kings had the looks and pedigree to make it as a racehorse – and that he certainly did. He even has a page dedicated to him on Wikipedia. 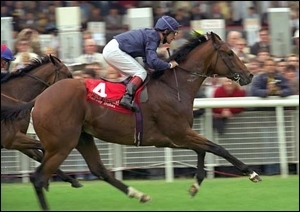 King of Kings was sold as a weanling and consigned by the Barronstown Stud to the Tattersalls sales in December 1995 where he was bought for 250,000 guineas by the bloodstock agent Demi O’Byrne on behalf of Coolmore Stud. Interestingly – his original name was ‘Turner’. Sue Magnier and Michael Tabor must have picked up something special about the horse, and changed his name fittingly to ‘King Of Kings’ after the hero of Percy Bysshe Shelley’s famous poem Ozymandias. “My name is Ozymandias, king of kings: Look on my works, ye Mighty, and despair!” Said Aiden O’ Brien: “He is simply breathtaking”. King Of Kings raced in England and Ireland where he achieved five wins from 1200 to 1600m from just seven starts and achieved a Timeform Rating of 125. His wins include – at two years of age – Gr 1 National Stakes over 1600 metres as well as the Gr 3 Railway Stakes over 1200m, as well as placing second in the Gr 3 Anglesey Stakes over 1260 metres and winning the Tyros Stakes. King Of Kings initially stood for six seasons at the illustrious Coolmore Stud, shuttling to their Ashford Stud in America as well as New Zealand and Australia. In New Zealand he was voted Champion Sire of Two Year Olds. He has established himself as a Sire-Of-Sires; his top performing son King’s Chapel(NZ) was imported to Bush Hill Stud and stood his first season in KZN last year. 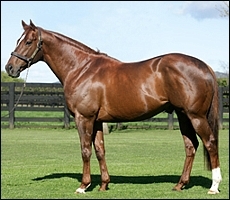 A big imposing chestnut with a superb temperament, King’s Chapel has himself had success with his progeny at the track overseas in Australia and New Zealand. King’s Chapel had 10 wins in New Zealand and Australia over 1200 to 1600m, and was Horse of the Year at 3, a Champion 3 year old and Champion Sprinter/Miler in New Zealand with a Rated Timeform of 123. Starting his career as a 2 year old, he won the Super Bonus Classique (Listed) over 1200 metres. At 3, he won the Grade 1 New Zealand 2000 Guineas over 1600m, the Grade 1 Telegraph Handicap (1200m), the Grade 1 Weight For Age Stakes (1400m) and the Listed Ray Coupland Stakes over 1400m. With just three crops to run in New Zealand to date from King’s Chapel’s first crop of current four year olds, he had the very smart Grade 2 winner King’s Ransom and the stakes’ placed Star of Kings. He also has current stakes winning 3 year old Princess Emmy, and from only 5 runners to date, current leading 2 year old filly Lady Chapel. In his 4 year old crop he has achieved a rate of 50% winners to runners. King Of Kings’ recent South African standouts have been Reign As Kings and the shock winner at Turffontein, King’s Temptress – of the Grade 2 SA Fillies Nursery where she beat two top fillies in this country, Franny and Ilha Da Rock. It was King’s Temptress’ debut start, winning by two lengths at even weights. The filly went off at incredible odds of 150-1. His daughter Indigo Princess has placed in the Grade 2 SA Fillies Nursery, and Miss Zummerudd who placed in the Grade 3 Umzimkhulu Stakes as well as placing in the Grade 2 KRA Fillies Guineas. Imperial Image placed in the Grade 3 Umzimkhulu Stakes and King’s Entourage is now a six-time winner. 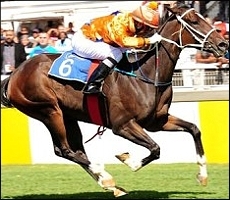 Reign As Kings is trained by Mike de Kock and ran second by a nose in his debut to My Jelly Bean. Just over a month later, he went out and won his second start by over 5 lengths, and then another win in a third start – defeating My Jelly Bean by 1.5 lengths carrying top weight. Reign As Kings certainly looks to be an exciting prospect. 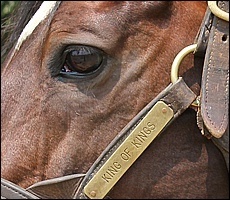 King Of Kings has produced mulitiple Stakes Winners and Stakes Placed horses overseas. One of his daughters Zooming Zellie(USA) won the Grade 3 Riverworld Stud Prix du Cap, as well placing in two Grade 2 and Listed events. In the Cape earlier this year, her son sold for R1 150 000. The colt is named Zambezi Torrent. Another daughter Ike’s Dream, a mulitiple Stakes winner won the Grade 1 STC Queen Of The Turf Stakes in Australia. 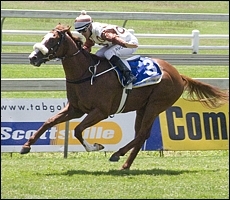 A colt, Reigning To Win, won the Gr 1 QTC Classic and placed second in a Grade 1. 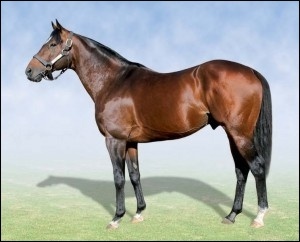 King Canute is a dual Group 2 winner in Australia, and in America he produced Sweet Win, another dual Gr 2 winner and was beaten a short head in the Gr 1 Del Mar Stakes. King Of Kings stands at Peter Blyth’s Clifton Stud. KZN breeding is very fortunate to have access to a stallion such as this.